Trace Minerals are Necessary for Optimal Health! Trace minerals are extremely important for health and are sadly overlooked. 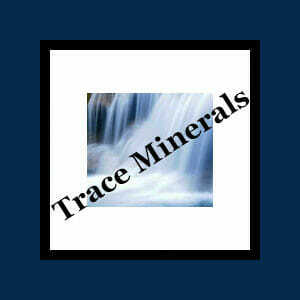 Where are Trace Minerals Found? Trace minerals are found in our oceans (or salt-based lakes such as; the Salt Lake of Salt Lake City), as well as, in our soil. In fact, trace minerals are found in small amounts within our body, but when they are depleted the deficiencies can be very destructive to our health. “Zinc is among the most essential minerals that our body needs, and as always, nature has provided all the zinc we need. However sadly, due to modern day pollution, processing of foods, and genetically modified (GM) crops, many people are now zinc deficient. In fact, some estimations report nearly half of the world’s population is zinc deficient – including the United States! What are Trace Minerals and Why do we Need Them? Trace minerals are important for metabolic functions in the body. If trace minerals are deficient in the body, then other substances and enzymes will not work properly. This could impede major systems such as our nervous and musculoskeletal systems. For example, there has been much research regarding how the deficiency of trace minerals such as chromium and vanadium may play a major role in the development of diabetes. Although trace minerals are considered to be micro-nutrients, meaning we only need them in small amounts, they are far too important to dismiss. Yet dismissed they are, since many multivitamins and multi-mineral supplements on the market today leave them out of their formulas. Luckily there are companies such as Trace Minerals Research that is at the forefront of bringing the importance of these minerals into the light. Adding a few drops of trace minerals to filtered water is a great way to get them into your diet. Even a simple fix such as using sea salt with trace minerals has helped people suffering from minor deficiencies recover. Simply using sea salt with trace minerals has helped many people recover from minor deficiencies. For more suggestions as to how you can incorporate more trace minerals into your diet refer to the article Are You Drinking Clean Water.